Off-Grid in Alaska: Porch Construction... PICS!!! 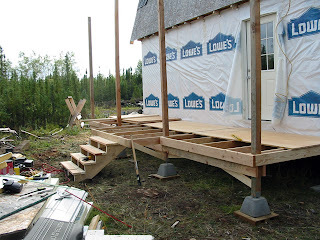 We changed the orginal porch design from 4' deep to 6' deep with a center bay 8' deep (forming a 2' stoop at the top of the stairs). Because of the integrated roofline, we had to get the porches on before we could FINALLY paper and shingle the cabin roof. Since it rained all summer, construction and subsequent roofing was delayed... so it got to rain INSIDE the cabin as well. Seriously! I had rain chains attached to the ceiling joints in the living room/kitchen to divert the leaks into buckets. Anyway, I, um, "misplaced" the camera during the construction of the western (front) porch, but managed to take pics of the eastern (back) porch when it wasn't rainingl and they're identical, so no harm done. Again, we're using surface pads and piers for the foundation. 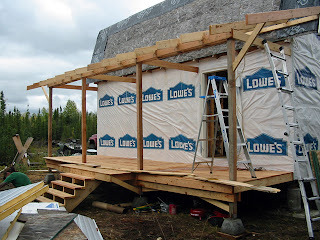 This time the pads are a sandwich of pressure treated 2x4 and plywood with precast concrete piers instead of reinforced concrete pads and poured piers like we used on the cabin since the porches are much lighter. 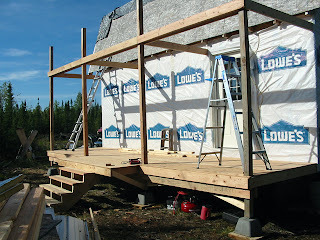 The cabin's surface foundation has proven quite stable and effective with barely any shift despite a rainy summer, a fast freeze-up, an unusually cold and snowy winter, an extremely wet and slow break-up, and another rainy summer... so we're confident that the porches won't go anywhere either. Since we didn't want to waste a lot of time and effort leveling the pads and pier jacks after building the deck, we opted to build the deck first in 3 independent square frames, attach each frame to the cabin's sill beam since it was already level side-to-side, use temporary braces to level the deck frames front-to-back, and then drop the posts into the pier blocks through their corresponding slots in each of the deck frames and plumb them up before nailing them to the already-leveled frames. Then we came back and shored the posts up with cross ties and angle braces. 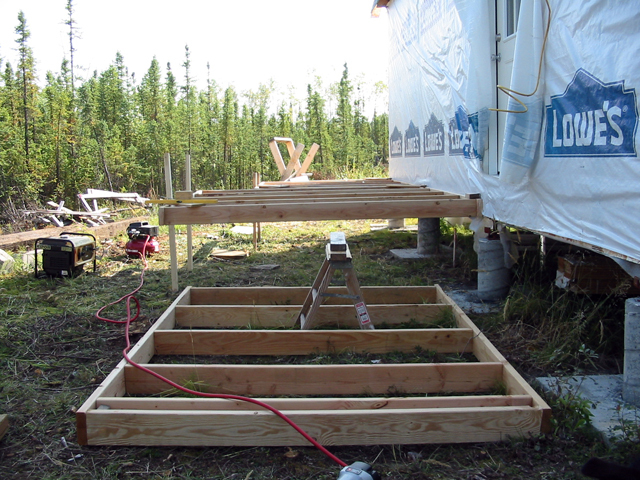 This method worked out pretty well for our two-man team without a flat surface to start with, and certainly went faster and smoother (and more level, plumb and square) than erecting the posts and beams first and dropping in the joists second like we did with the cabin floor. Just one of the many benefits to designing and building on a modular grid! Floor frames built first and then attached to the sill beam. Pads, piers and posts placed after the frames were attached. Ripley, sneaking into the shot again! We added cross-ties in front and back of the posts under the joists as extra insurance, and angle braces to prevent racking. 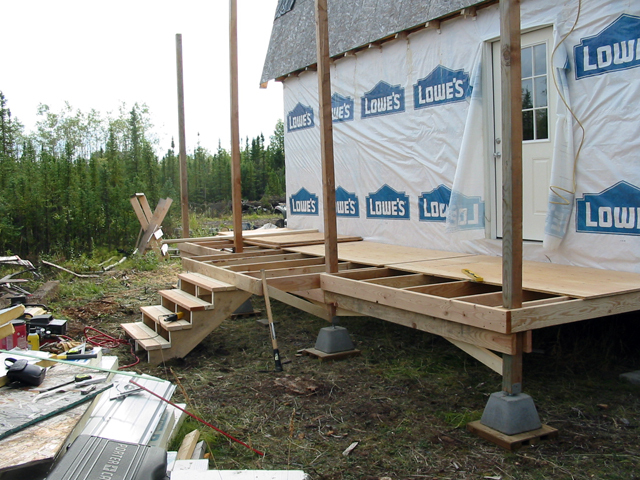 We attached the stairs to the stoop with an extra riser nailed through the rim and joists on the inside of the floor frame. Then angle-braced the nose of the cantilever back to the posts just to make sure everything was solid. AND we put the decking down FIRST this time, so I wouldn't be able to fall through like I did on the western porch! Double-checked that the posts were plumb side-to-side and tied them together with a header plate on the inside and outside. 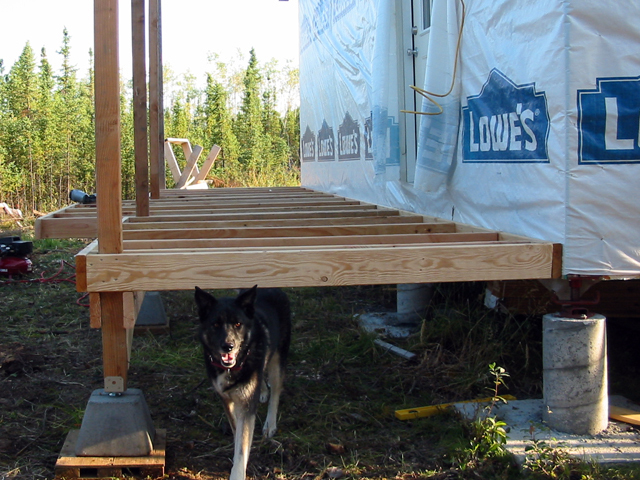 Then checked plumb back-to-front and tied the porch posts to the cabin posts -- yay for the modular grid again! Trimmed off the tops of the post and added the rafters, with an angle brace as extra support on the flying rafters. and that little bit won't be exposed too much after we get the gutters on. 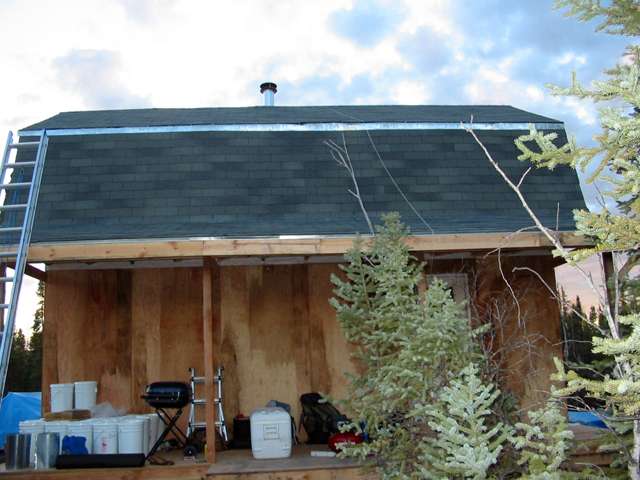 Then it was just a matter of adding sheathing, drip edge, tarpaper, shingles and flashing to finish up the whole roof. but since the lower rafters are nearly vertical, we opted to flash it like a roof-wall connection rather than an adjoining roof. So here's the front (south) dead-on with both completed porches. LOL - kinda has an Amityville Horror thing going on from this angle! Now, if I could just get James Brolin or Ryan Reynolds to come split that mound of wood for me!! 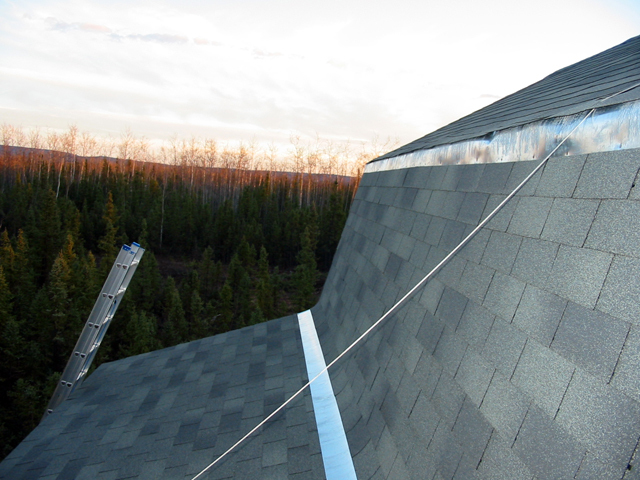 And oblique angle from the SW corner, which shows the roof better. 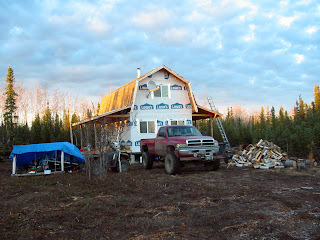 Yes, our cabin is really that small and our truck is really that big ROFL!! And the back porch with the siding installed (hmmm, to paint or stain, that is the question). Remarkably, we managed a halfway decent job keeping the shingles even, straight and smooth! 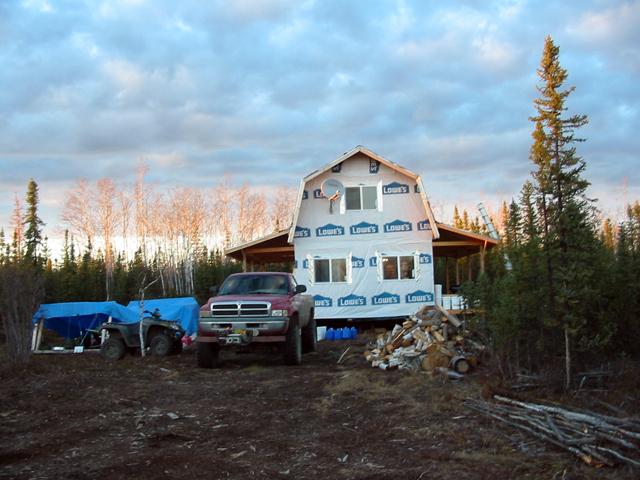 We'll be adding the siding on all faces eventually, but might not make it before the snow flies this year. With winter coming, the worst of the rainy season should be over, so we're not panicking to get the gutters up either; but we'll have straight gutters with a downspout into collection barrels on the south end for watering the garden with sun-warmed rainwater, rather than the near-frozen hard water that would come up from a well. So you got a two story cabin?We have seen some like that here.I really liked it but they were 25,000 and that was just the shell.Yours looks great and you and yours have been working hard.All I can say for the trees,firewood!At least you'd stay warm this winter. Looking good! What did you cover the angels on the roof at the second floor? Shingles? 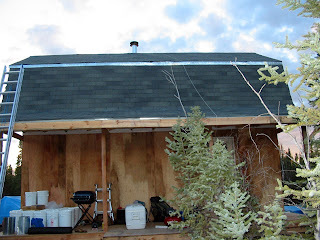 Hi Marybeth - we covered all the roof planes with felt/tar paper and then shingles. And then used galvanized aluminum flashing in the valley where the porch & cabin meet and the pitch break where the gambrel rafters change angle. We decided to use flashing because our lower gambrel rafters are steep (75 degrees) and the pitch changes are fairly drastic... the porch is 15 degrees and the upper gambrel rafters are 30 degrees. Hi Ann - yes, our cabin is two story... well, technically, it's a 1 story with a loft since the gambrel roof forms the upstairs "walls". Getting more usable floor space upstairs was the main reason we decided to use a gambrel style roof rather than a typical gable. The only additional walls we needed for the upstairs were the endwalls, and they're minimal framing which didn't add to the price of the house much at all. Additionally, going with a gambrel allowed us to use standard 8' lumber for the rafters rather than needing to purchase and transport longer pieces... that saved us quite a bit of money as well.